Commercial buildings require regular maintenance in order to stay clean and looking fresh. This is especially true for areas where large areas are covered in tiling and grout which are often present in bathrooms and kitchens. Bestway Carpet & Tile Cleaning specializes in commercial tile cleaning and grout cleaing for any size commercial building. After our technicians are finished with their cleaning methods, the tile and grout in your commercial building can look like new. 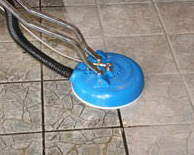 Our technicians pay special attention to problem areas and make sure to remove stains, giving your tile its shine back. With the help of a special sealant to prevent future stains, your tile remains looking cleaner for longer. Bestway Carpet & Tile Cleaning is one of the best commercial cleaning companies in the Middletown NJ area and we specialize in professional tile and grout cleaning. Our technicians arrive at your commercial building armed with the most advanced cleaning systems available in the commercial cleaning industry to make sure to get your tile and grout sparkling like new. Utilizing powerful truck-mounted extraction systems gives the tile in your commercial building the most complete clean possible. All dirt and grime that is trapped in small crevices of textured tile is removed entirely. In order to keep your tile and grout looking like new for longer, we offer a high-quality sealant application after we finish our cleaning. Our customers choose this option often in order to get the most out of their commercial tile & grout cleaning and to prevent permanent staining of tile in the future. Plus, when it comes time for a regular cleaning of your tile, the sealant allows for a more simple, cost-effective and quicker cleaning. We strive to provide Middletown NJ businesses with the absolute best commercial tile cleaning services available in the Metro NJ area and guarantee your satisfaction. For additional information on how the experts at Bestway Carpet & Tile Cleaning can help your tile shine like new, contact friendly customer representatives today. Remember, all of the commercial cleaning services performed in Middletown are guaranteed to be of the highest quality and delivered in a professional and time-effective manner.